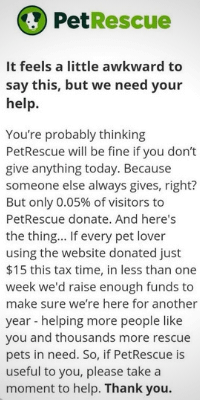 Situation: PetRescue needed to raise funds at tax time to support all 15 of their free pet search and adoption services, including the website which connects thousands of homeless pets with thousands of pet seekers every day. They’d been successful in securing a gift matching pledge from one of their major corporate partners, so they needed a fundraising campaign strategy to fully leverage this opportunity. Deliverables: At the time, Caboodle copywriter Jo was employed as PetRescue’s Fundraising and Brand Development Lead. And for the first time ever, PetRescue finally had the in-house web development resources to build a fully-integrated, mobile-friendly and customised donation pop-up on the PetRescue website - targeting active users of PetRescue’s free pet search and adoption services. Jo worked with the team to develop a multi-channel digital campaign strategy and content for the website pop-up, donation receipts, email marketing, a press release, SMS reminders and targeted social media ads. The pop-up was shown to visitors over a million times during the months of May and June, and raised almost $360,000 (including gift matching from Woolworths Pet Insurance) - a conversion rate of 0.49% and a median donation of $15. That’s a record-breaking return on investment of 2,946% and enough funds to keep PetRescue’s animal welfare programs and free digital services running to help connect 36,000 more rescue pets with 36,000 new families. The number of donors who opted to donate monthly was unprecedented too. Based on 2017 campaign results, the target was set at 50 new monthly donors. 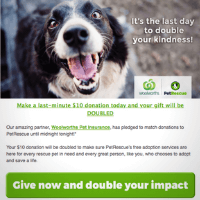 By the end of the two-month tax time appeal, PetRescue’s monthly donor base had grown by 336, more than doubling its existing database of monthly givers. Since Jo left PetRescue to return full time to Caboodle Copywriting, we are proud to be a preferred fundraising and copywriting supplier for the PetRescue team. Find out more about our charity and fundraising copywriting experience, or contact our freelance copywriters to discuss the messaging and strategy for your next donor communications or fundraising campaign.